Yup – that’s how far back this goes. I like to go in order. Did I mention that I plan on going to more baseball games this season? David Wright’s first at-bat of the May 24, 2014 game. Cheese’s brisket sandwich from Blue Smoke; we were both surprised to see that it was chopped brisket (though my photo of the menu indicates that it says it is chopped), but he seemed to enjoy his sandwich. I’ve been craving ribs lately, so I opted for the ribs. for $9.75 this is actually a fairly decent value – I found them satisfying, meaty, and really filling. I mean 4 ribs! that’s a lot of food! I was happy afterwards. I didn’t photograph them but Cheese also ordered fries from Box Frites that we shared, and they were good as usual. David Wright’s first at-bat on May 25, 2014, the first game of a single admission doubleheader. I went to a game with a “friend” the day after the game with Cheese. We concentrated more on drinking than on eating, but shared nachos from the Nachos Grande cart which I thought were awesome. No meat; cheese, beans, and extra pico de gallo. Satisfying in that “I’m drinking and eating nachos” way. David Wright’s first at-bat of the second game of the single admission doubleheader; this photo was taken from where Mitch (the “friend”) likes to watch games. I don’t get the appeal – okay, you’re on the Shea Bridge, but you can’t see anything! While writing this, I realized I’d never posted pictures of the food I ate between this game and the last post about Citi Field. 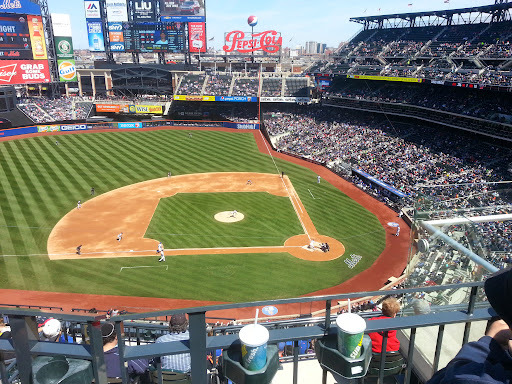 David Wright’s first at-bat of the game on April 20, 2014; tickets courtesy of my best friend. I forgot my real camera at this game so used my phone. 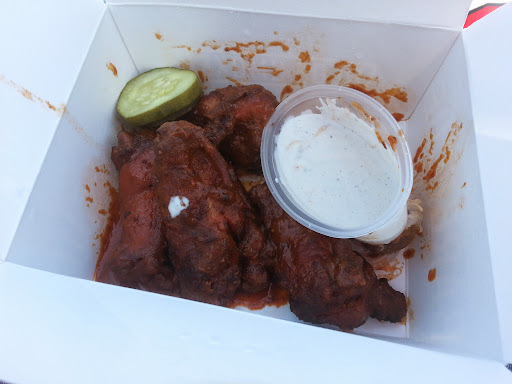 I ordered what used to be my standard order at the park: Blue Smoke’s chipotle wings, but this time they almost burned my face off. I soldiered on and ate them, but they overstepped the line from almost-too-spicy (what they used to be) and entered really-too-spicy for me. Not enough blue cheese either! I didn’t take a picture of BFF’s sandwich, though it wound up being what Cheese got above so it works out 😉 I know she liked it! and I got her pickles because she doesn’t like pickles. We shared the cheddar bacon fries from Box Frites, and these were kind of awesome. Crisp fries topped with lots of bacon and liquid cheese, and just perfect drunk food (though I wasn’t drinking this time). got the chicken schnitzel sandwich. All of this from Box Frites. Crisp fried chicken cutlet topped with a horseradish mustard sauce and purple cabbage slaw, it was actually really tasty. The biggest drawback to this sandwich was the bread: it was super puffy and detracted from the chicken itself, as it kind of took over the sandwich at some points. Otherwise, I thoroughly enjoyed it and would not be unhappy to order it again. So there you go: what I’ve been eating at the stadium! Stay tuned for more stadium eats, though the Mets have been hardly home on weekends in June (just this past weekend, but I didn’t eat there)… I plan on eating a few other new things at the stadium as well! Box Frites seems to be the place to go to. WHO DOESN’T LIKE PICKLES? Seriously. YAY ::skippyhappydance:: FF gets to go to baseball games and Skippy gets to read about the food. Oh and IMO – the only way to eat nachos is that way [well, with real cheese] no meat. Never meat. But I can never find them so I make them myself.